Greetings, humans! 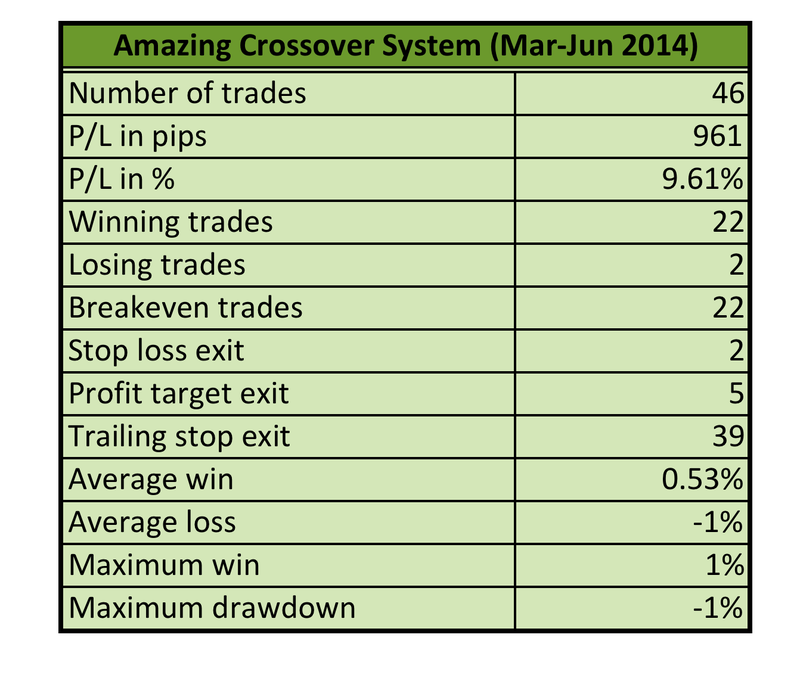 As promised, here are the backtest results for the Amazing Crossover System. As the mechanical system name suggests, the results were quite amazing indeed. I’ve also got a few comments on my blog entry on the system rules and it appears that some readers were also impressed by the results. Since the system poster, ForexPhantom, specified that the 1-hour charts MUST be used, I stuck to that rule and ran the backtesting on the EUR/USD pair. Unfortunately, my memory card only stores historical price action up until March 2014 so I had no choice but to use only four months’ worth of data for my backtests. The system was still able to generate 46 trade signals and 22 out of those turned out to be winning ones. It churned out only two losses while the remaining 22 came out at breakeven. A closer look at the exit signals reveals that the 20-pip trailing stop does a pretty good job of protecting profits, although it prevented the system from catching a few longer-term moves. Nonetheless, there were only a couple of instances when the 100-pip initial stop loss was hit, and this took place during very volatile market conditions – one of which was when the ECB decided to announce several rate cuts. The RSI also does a good job of filtering out signals that take place during periods of market consolidation and, if a valid signal is generated then, the trailing stop enables the trader to jump out at breakeven if price moves sideways. All in all, I’m pretty impressed (Did I say this already? Well, I’ll say it again!) with how the system fared so far, considering how it made nearly 10% in just a span of four months. I’ll keep you posted on my forward testing results for July next week. Stay tuned!